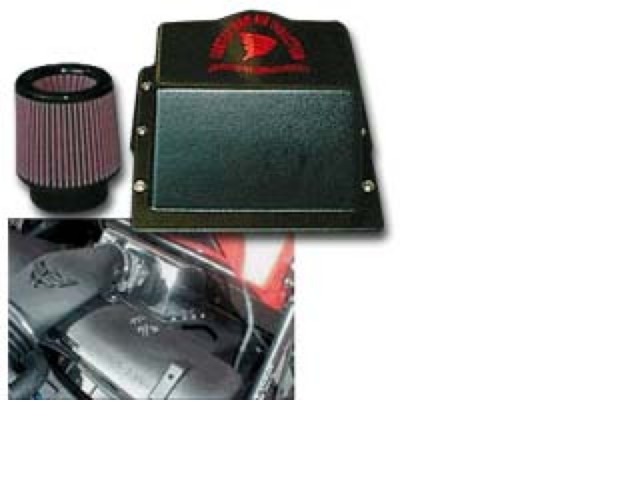 The Vortex Rammer Kit replaces the restrictive stock air box assembly. Look closely at the filter and note that this is not the K&N filter that everyone sells. This revolutionary air cleaner contains an internal vortex velocity stack. It obtains cool, pressurized air from the radiator cavity through your modified shroud. The specially designed scoop then forces it into the rammer sealed box, where in turn, it directly injects cold air into your intake. To the left is the black Vortex Rammer box with air filter. Under that is the clear box installed in a C5 Corvette.